But critics warned that China was becoming the ‘Wild West’ of genetic research saying it was the first step towards designer children and called for a worldwide ban on the practice. The work was reported in the journal Protein and Cell after the prestigious science journals Nature and Science refused to publish the study on ethical grounds. "This news emphasises the need for an immediate global ban on the creation of GM designer babies,” said Human Genetics Alert Director, Dr David King. “It is critical that we avoid a eugenic future in which the rich can buy themselves a baby with built-in genetic advantages. “It is entirely unnecessary since there are already many ethical ways to avoid thalassaemia. This research is a classic example of scientific careerism - assuring one's place in the history books even though the research is unnecessary and unethical." The team has used a gene-editing technique known as CRISPR/Cas9 which was discovered by scientists at MIT. It works by capitalising on the fact that bacteria attack viruses by snipping away part of their genetic code, effectively dismembering the virus. The CRISPR technique uses a bacterially derived protein to cut-away a particular gene, which is then replaced or repaired by another molecule introduced at the same time. The technique has been used in adult cells and animal models but never in human embyos. Advocates of gene editing say that it could eradicate devastating inherited disease. But others are worried that it crosses an ethical line, allowing children to be genetically engineered. And because the genetic changes are happening to embryos the changes will be passed down to future generations. Huang and his colleagues set out to see if the procedure could replace a gene in a single-cell fertilized human embryo; in principle, all cells produced as the embryo developed would then have the repaired gene. The Chinese team used embryos they obtained from the fertility clinics had been created for use in IVF but had an extra set of chromosomes, following fertilization by two sperm, which stops them resulting in a live birth. They injected 86 embryos with the Cas9 protein and left them for two days to allow the gene-editing to take place. Of the 71 embryos that survived, 54 were genetically tested. This revealed that just 28 were successfully spliced, and only a fraction of those contained the replacement genetic material. They also found a number of unexpected mutations in genes which should not have been effected by the technique. British scientists said that no more experiments should be carried out until there had been an international agreement on whether the technique was safe and ethical. Prof Shirley Hodgson, Professor of Cancer Genetics, St George’s University of London, said: “I think that this is a significant departure from currently accepted research practice. Can we be certain that the embryos that the researchers were working on were indeed non-viable? "Any proposal to do germline genetic manipulation should be very carefully considered by international regulatory bodies before it should be considered as a serious research prospect." 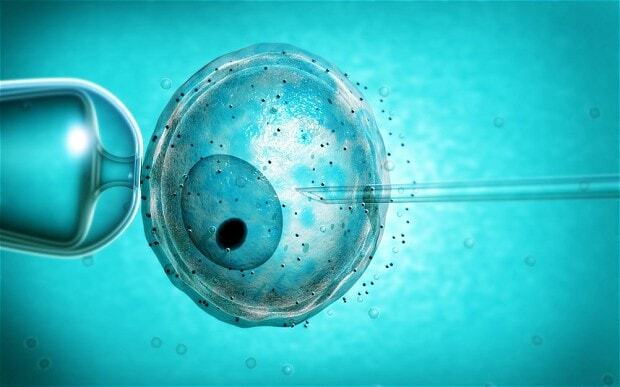 Dr Philippa Brice, of the health policy think-tank the PHG Foundation, added: “This story underlines the urgent necessity for international dialogue over the ethics of germline gene editing in human embryos, well in advance of any progression towards theoretical clinical application. George Daley, a stem-cell biologist at Harvard Medical School in Boston added: "The study is a landmark, as well as a cautionary tale. "Their study should be a stern warning to any practitioner who thinks the technology is ready for testing to eradicate disease genes." Huang said he had abandoned the current project to go back to working out how to minimise the unexpected mutations in adults cells and animals. However at least four groups in China are believed to be currently working on genetically modifying human embryos.